Today is the 350.org International Day of Climate Action and we've marked it in our own small, local way. This morning I headed over to the community garden for the monthly Waste Not! Fruit and Vegie swap, loaded with my excess tomato and capsicum seedlings. 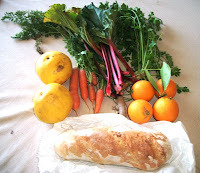 Which I exchanged for 2 grapefruits, 4 oranges, some carrots, rhubarb, parsley, and ginger. I also bought a loaf of bread that the Port Kembla Men's Association had baked in their wood-fired oven. It was a great day to be out in the garden and I enjoyed catching up with people and enjoying a cup of coffee courtesy of the Men's Association. After heading home briefly for lunch, I went over to Futureworld Eco-Technology Centre to join the Cunning Plans Dept who had headed over in the morning to help with their open day. The open day ran from 10am to 2pm and I understand that they had a really good turn out with over 100 visitors through the doors. They also had an Ideas Tree at the centre for people to write down their ideas about what we can do to move towards a future of 350ppm. In the evening, we looked at the 350.org website and were amazed at the number of actions and photos flowing in from around the world. Over 5200 events across 181 countries. It feels awesome to have been a part of that and to see so many people being passionate about this. Update: The Futureworld action photos can be found on the 350.org flickr site here. Wish we'd remembered to take some photos at the vegie swap with the 350 motif.